I’ve updated my Class schedule for March and am finalizing the details for my April card class – the theme in April is going to be babies, since spring is all about new beginnings and joy. This week’s challenge over on The Paperie Blog is to create an interactive Scrapbook layout or card, so I posted one of the cards we made in my recent Cupcake Card Making Class at The Paperie this past Monday. A Muse Stamps: Cupcake, Cupcake Builder set (sentiment). A Muse Papers: Pink Shimmer Couture, Kitchen Black Notecard, Ocean Blue Solid cardstock. 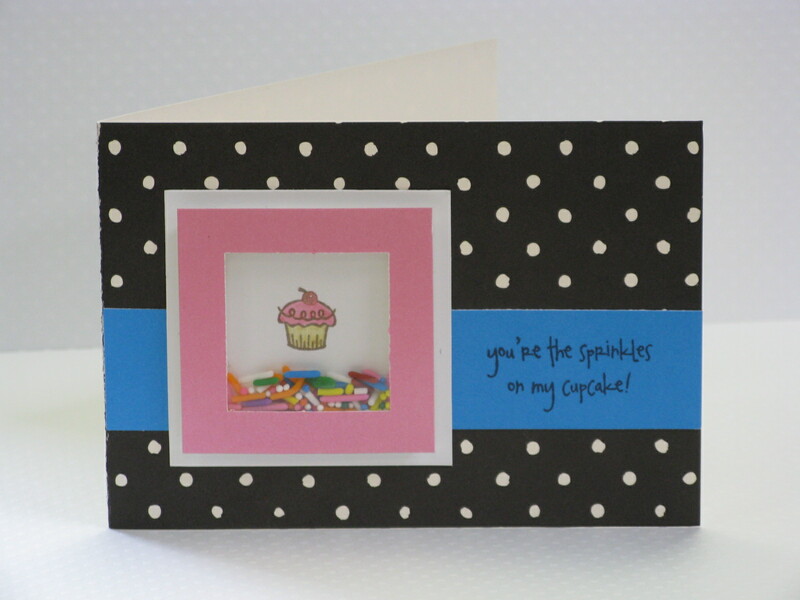 I love shaker cards – even better when you can use REAL sprinkles in them. So cute, Meghan! I’ve never tried a shaker card before, but you make it sound so easy, maybe I will! I did it! Thanks for the inspiration! This card is so fun! Great job!